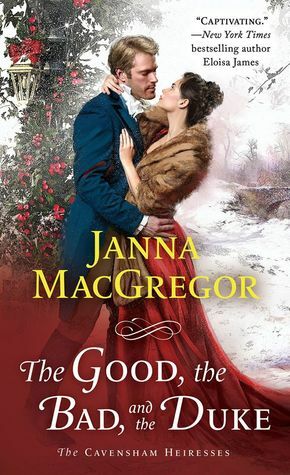 Janna MacGregor is a talented writer. I was charmed from the first page. Her characters are dazzling. They made me laugh so hard. I cried at moments and rooted for them. I wanted their happiness as much as they did. The female protagonist is a delightful young woman. In this book, I got an inside glimpse as to what she was like as a child and as a young woman. That was wonderfully woven much needed. Lady Daphne was shy with a bold heart. Now, as a woman, she is both bold in heart and in action. I couldn’t help but laugh…the Duke, her friend, was going to have his hands full. The title, The Good, the Bad, and the Duke perfectly suited this read in so many ways. In some cases, I felt like I could see the frustration steam spouting from his head at the troubles Lady Daphne got herself into at times. She has always loved the Duke even when she was a kid. Now, she still felt the same way. Her natural way of helping others propelled their new reacquainted relationship. That made me eager to read more. Both Lady Daphne and Duke Paul, were charming. Irresistible characters that drew me closer to their stories. Each risked something that was important to them to help others. Their blossomed romance made me blush so many shades of red. Overall, I found this novel, exciting and enjoyable to read. I got lost within The Good, the Bad, and the Duke easily.